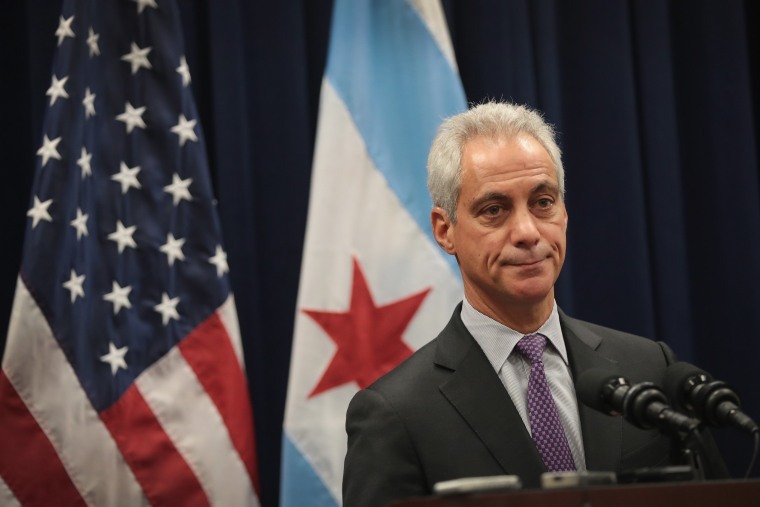 CHICAGO — The city of Chicago changed course Tuesday and said it now wants to carry out far-reaching reforms of its police under strict federal court supervision, abandoning a draft deal on reforms with the Trump administration that envisioned no court role. The new approach led to the unusual sight of Mayor Rahm Emanuel and Illinois Attorney General Lisa Madigan at a joint news conference to announce that Madigan — with the mayor's full support — had just sued the city seeking court oversight of the beleaguered police force. The legal action kills the draft plan negotiated over months between Chicago and the U.S. Justice Department. That agreement drew sharp criticism from community activists, who said transforming city's 12,000-officer force couldn't possibly succeed without court scrutiny. Emanuel said Tuesday he would have preferred to work with the Justice Department, but that that was impossible because the Trump administration abandoned the Obama administration's standard practice of taking police reform plans to a judge. "The Trump administration has rejected the path of a consent decree ... and it became clear they are disinterested in reform," he told reporters. "We do not have a partner in the Trump administration Justice Department. We have a partner in the Illinois attorney general. Madigan said the state of Illinois was "stepping into the shoes of the Department of Justice ... shoes that the DOJ has abandoned." The president of Chicago's police union, Kevin Graham, criticized the legal action, saying in a Tuesday statement that "a consent decree is a potential catastrophe for Chicago." He said court oversight would make it harder for officers to do their jobs and keep crime under control. "People affected by police abuse have to have a formal role and the mayor and his lawyers are continuing to say they're not interested," he said. The Justice Department investigation was prompted by a video released in late 2015 that showed a white police officer shooting 17-year-old Laquan McDonald 16 times as the teenager appeared to walk away from police carrying a small, folded knife. The video's release prompted weeks of protests and calls for reforms. Tuesday's lawsuit noted that Chicago has taken steps to try to curtail abuses by police since video of the fatal shooting provoked such outrage. But it added that the reforms were inadequate and required "a comprehensive roadmap" overseen by a judge and detailing "what will be done, when it will be done, and what resources will be used to accomplish the needed changes."